Recommended citation: Hong HG. Increase in Electrodermal Activity on Acupuncture Points of Lymphatic, Lung, Nervous, Endocrine and Heart Meridians after Running Exercise, a Single Case Study. OBM Integrative and Complementary Medicine 2019;4(1):13; doi:10.21926/obm.icm.1901019. Background: Electrodermal measurement of acupuncture points has been correlated to physiologic and pathologic conditions with clinical and laboratory studies. Emerging evidence indicates that in addition to therapeutic effect, acupuncture points may also have diagnostic properties. However, physiologic basis of this phenomenon is still unknown. Objective: To determine how electrodermal activity of acupuncture points on hands and feet responds to exercise-induced sympathetic stress and how electrodermal measurement correlates to skin temperature. Materials and Methods: A 20-minute running exercise with a moderate intensity based on Borg Rating of Perceived Exertion Scale was carried out with one healthy male subject for 15 sessions. Electrodermal activity of acupuncture points was tested before and after exercise with a meridian testing system, Electroacupuncture According to Voll. Bio signs including heart rate, breathing rate, blood oxygen level and skin temperature for forehead, hands and feet were also measured. Result: Significant increase in electrodermal activity for five hand meridians, including Lymphatic, Lung, Nervous system, Endocrine systems and Heart, was observed after exercise. There was no significant change for the rest of hand meridians and foot meridians. Significant increase in foot skin temperature and decrease in hand and forehead temperature were also observed after exercise. The change in skin temperature for hand and foot was inversely related to that of electrodermal measures. Conclusion: Despite the limitations, the finding of the study is consistent with expected physiologic responses to the stress due to running exercise and it is feasible to conduct clinical studies with larger sample size to further study the change of electrodermal activity of acupuncture points after exercise. It also suggests that electrodermal testing of acupuncture points may be useful to detect stresses from corresponding organs and tissues. More clinical and mechanistic studies are warranted. Electrodermal measurement of acupuncture point (AP) and its correlations to physiologic conditions have been studied since the 1950’s. Early independent studies suggested that skin of acupuncture points showed unique electrical characteristics. [1,2,3,4] Recent studies have suggested that 1) acupuncture points show lower electrical skin resistance and higher conductivity than surrounding tissue; 2) change in electrical resistance of specific acupuncture points is correlated to certain clinical conditions; 3) clinical and laboratory studies show that experimentally induced physiological dysfunction and subsequent recovery correlates with a change in electrical impedance at relevant acupuncture points. [5,6,7,8] Emerging evidence indicates that in addition to therapeutic effect, APs may also have diagnostic properties. The APs from both systems can be used to diagnose diseases through measuring electrodermal activities. [9,10,11] Although testing instruments of the two systems vary in their recommended testing sites, probe design, and electrical parameters, their testing methodologies are similar. They also share common barriers that make this technique a subject of controversy and skepticism. One of the most important barriers is the lack of rigorous clinical studies to assess their validity. In the past years studies have shown that electrodermal testing using both EAV and Chinese meridian system are accurate and reliable tool to measure electrodermal activities in APs. [10,12] There have also been pilot studies using either systems correlating electrodermal testing with pathophysiological conditions [11,13,14,15] as well as evaluating therapeutic practices. [16,17] A 60-case retrospective study showed that specific changes in EAV testing from Lung and Lymphatic meridians were correlated to lung and upper respiratory symptoms, respectively. More rigorous clinical studies are certainly needed to validate electrodermal testing for APs. The other important barrier of this technique is the lack of experimental research that reveals the physiologic basis for the testing. The EAV belongs to an area of research known as electrodermal activity, a.k.a. galvanic skin response, or sympathetic skin response (SSR). The SSR represents an electrical potential generated in skin sweat glands. It originates by activation of the SSR reflex arch evoked by a variety of internal or externally stimuli. The effectors of the reflex arch activate eccrine sweat glands with cholinergic mediation. Sympathetic nervous system is responsible for up- and down-regulating many homeostatic mechanisms in living organisms. Sympathetic nerve fibers innervate tissues in almost every organ and system. Thus, it is reasonable to hypothesize that the change in SSR may also reflect homeostasis of each associated organ, system and tissue type. Time-varying analysis of electrodermal activity during exercise has been studied. Posada-Quintero et al. reported a shifting of the sympathetic dynamics to higher frequencies in the electrodermal signal when subjects undergo physical activity. Effect of physical exercise on electrodermal activity of APs has also been studied. Garoppo reported that aerobic running exercise induced an overall increase in electrodermal activity of APs for all 6 hand meridians but not for foot meridians using a Chinese meridian measuring system, AcuGraph. Pontarollo also tested 4 APs on hand for Chinese meridians of Lung, San Jiao and Heart, plus a negative control, during physical exercise with a German digital multi-meter ET and reported an increase of electrodermal activity of Heart meridian only. Both studies examined Chinese meridian system with different measuring equipment and reported a possible increase of electrodermal activity on hand meridian(s). However, effect of exercise on electrodermal activity of the EAV system has never been studied. Aerobic-running exercise is a stress to cardiovascular, nervous, endocrine and respiratory systems. Nether studies were able to link physical stress to specific meridians that reflect complete physiological stress profile. It is probably due to the lack of meridian specificity of Chinese meridian system and/or improper equipment used in the study. The objective of this study is to test the feasibility of examining the effect of exercise-induced stress on electrodermal activity of APs with a standardized EAV system, which provides more detailed meridian profile directly linked to Western physiologic systems. It is also interesting to know which meridian(s) is activated or stressed with an EAV system. Skin blood vessels and sweat glands are both regulated by sympathetic efferent C fibers. Skin blood vessels, controlled by sympathetic vasomotor response (VR), regulate convective transfer of heat to skin; whereas the sweat production, controlled by SSR, regulates evaporative heat from skin. [24,25] Co-activation of SSR and VR in hands was found during rhythmic breathing and Valsava maneuver with simultaneous measurement of SSR and VR. The electrodermal activity of APs is believed to be innervated by SSR. The other objective of this study is to examine, upon exercise, the correlation of electrodermal activity of APs with skin temperature, controlled by SSR vs VR, respectively. One healthy subject, 55 years-old Asian male with no medication taking history, participated in the study. The procedure of the study is shown as a flowchart in Figure 1. The subject rested quietly for 5 minutes. Physical signs including heart rate (HR), blood oxygen level (O2), breathing rate (BR), skin surface temperature (Temp) of forehead, bilateral hands and feet were tested. HR and O2 were measured from the left index finger with the Pulse Oximeter (Model: CMS50D) manufactured by AccuMed. Temp was obtained from the center of the forehead, dorsal side of both hands and feet with the Dual Mode Thermometer (Model: DMT-116A) manufactured by IProven. The testing was done in an air-conditioning room with a temperature set to 77 degree Fahrenheit. EAV testing was performed using a computerized EAV instrument, MSAS Professional with a software version 1.45, manufactured by the Biomeridian Corporation, Utah. The control measurement points (CMPs) for all 40 meridians were tested. Then, a 20-minute run was performed with a Borg Rating of Perceived Exertion Scale (RPE) 12-13, indicating a moderate intensity activity. Immediately after running stopped, subject’s HR, O2, BR and Temp were tested again. EAV testing was also performed. Totally 15 sessions of the experiment were conducted on 15 different days within three month period. Figure 1 Procedure Flowchart. Procedure of the experiment is shown in the flowchart. Activities and tests are listed from the start to the end. The tests included heart rate (HR), blood pressure (BP), blood oxygen level (O2), skin temperature (Temp) and EAV testing. AMV was designed for statistical analysis and data comparison only with no clinical value. Statistical analyses, such as the mean, standard deviation (SD), and paired t-test were performed using Microsoft Excel, version 2013. Some minor discrepancies in EAV reading were found between left and right meridians. Comparison of the lateral meridian readings was not the aim of this study. Thus, an average readings from the left and right meridians was used for analysis. EAV testing results were summarized in Table 1 and illustrated in Figure 2. An overall increase in EAV reading was observed for the hand meridians except for Large Intestine (LI). However, there are significant effects of only five hand meridians, Lymphatic system (LY), Lungs (LU), Nervous system (NE), Endocrine system (TW) and Heart (HE), t(25) = -8.16, t(21) = -11.25, t(21) = -4.01, t(20) = -3.35 and t(25) = -6.05, respectively, p<0.01, with the post-exercise receiving higher score than the pre-exercise. No significant change in EAV reading was found for other hand meridians and the foot meridians. The result clearly indicates that the five specific hand meridians responded to exercise significantly while the other meridians did not. Table 1 EAV Testing before and after exercise. *-Significant increase after exercise (P<0.01). LY-Lymphatic system, LU-Lungs, LI-Large intestine, NE-Nervous system, CI-Circulatory system, AL-Allergy, OR-Organ system, TW-Endocrine system, HE-Heart, SI-Small intestine, PA-Pancreas, SP-Spleen, LV-Liver, JO-Joints, ST-Stomach, FI-Fibroids, SK-Skin, FA-Fatty tissue, GB-Gallbladder, KI-Kidney, UB-Urinary bladder. 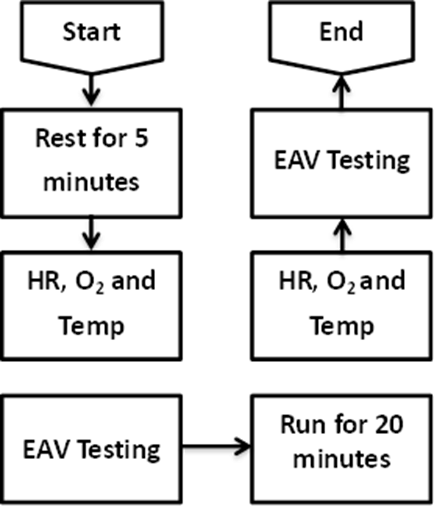 Figure 2 EAV Testing Before and After Exercise. EAV testing before and after exercise is plotted with means and standard errors. Abbreviations are LY-Lymphatic, LU-Lung, LI-Large intestine, NE-Nervous system, CI-Circulation, AL-Allergy, OR-Cellular metabolism, HE-Heart, SI-Small intestine, SP-Spleen, PA-Pancreas, LV-Liver, JO-Stomach, ST-Stomach, FI-Fibroid tissue, SK-Skin, FA-Fatty tissue, GB-Gallbladder, KI-Kidney and UB-Urinary bladder. Table 2 Bio Signs before and after Exercise. 1–Bpm-beats per minute; cpm-cycle per minute; SD-standard deviation. 2–Significant difference between Pre and Post-exercise results (P<0.01). The changes in bio signs, HR, BR, O2, and Temp, mean with standard deviation for the 15 sessions before and after exercise were summarized in Table 2. The HR and BR increased markedly after exercise, which is expected and a validation to sympathetic stress induced by exercise. Blood oxygen level showed no obvious change as expected. No bilateral difference was found in skin temperature readings. Thus, an average from the left and right readings were used for analysis. The changes in skin temperature for hand, foot and forehead were illustrated in Figure 3. There was a significant effect for foot skin temperature, t(28) = -34.52, p<0.01, with post-exercise receiving higher score than pre-exercise. It indicates that foot skin temperature increased significantly after exercise. However, there were also significant effects for hand and forehead skin temperature, t(28) = 11.47 and t(28) = 4.13, respectively, p<0.01, with pre-exercise receiving higher score than post-exercise. It indicates that hand and forehead temperature decreased slightly but significantly after exercise. Figure 3 Skin Temperature before and after Exercise. 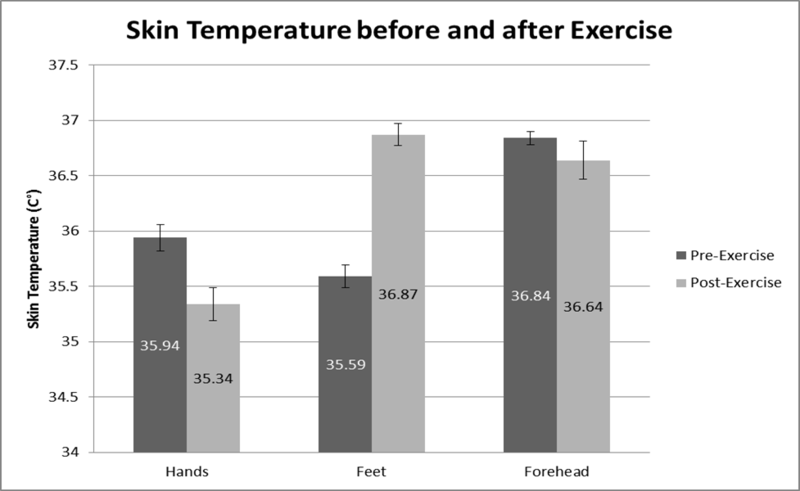 Skin temperature of hand, foot and forehead is compared before and after exercise. Means with standard errors are plotted into the graph with pre and post exercise labelled. Exercise increases heart rate and respiratory rate due to the activation of the sympathetic nervous system and the release of catecholamines. Thus, exercise is considered a stress to respiratory, heart, nervous and endocrine systems. In the meantime, sympathetic stimulation may inhibit the function of other internal organs such as liver, spleen, pancreas, stomach, gallbladder, kidney and urinary bladder. In addition to the autonomic effects of exercise, blood is usually shunted away from the digestive tract toward the skeletal muscles. This study showed that aerobic running significantly raised HR and BR, a clear sign of sympathetic arousal. This study is consistent with the previous findings from Garoppo  and Pontarollo  but provide further specificity of the meridians by showing significant increase in electrodermal activity of LY, LU, NE, TW and HE. The foot meridians remained unchanged. It has been previous documented that LY and LU meridians are connected to upper respiratory tissues and lungs, respectively. Chinese meridian Triple Warmer (TW) is renamed as Endocrine system in EAV. The result of the increase in electrodermal activity for meridians of respiratory, nervous, endocrine systems and the heart is consistent with expected physiologic responses for exercise-induced stress. It indicates that EAV may be a useful tool to test functions and stresses of corresponding organs and systems. Skin temperature directly correlates to skin blood flow, which is controlled by thermoregulatory system and sympathetic VR. Fall in skin temperature during exercise has been observed and reported. The possible reason for the temperature drop has been suggested to be reflex-induced vasoconstriction but not thermoregulatory vasodilation, such as evaporation due to skin perspiration. Increased skin blood flow during exercise may add to the demands on cardiac output and confers additional circulatory strain. Thus, it is reasonable to believe that the decrease in skin temperature is simply a physiologic adaptive response to reduce cardiovascular stress during exercise. The increase of foot skin temperature in this study is probably due to waring of shoes that prevented heat dissipation during exercise. The regulatory mechanism for skin temperature during exercise is not the aim of this study. However, it is interesting to combine the data of EAV testing and skin temperature. Results show an increase in EAV reading in 5 hand meridians but a decrease in hand skin temperature, an activation of SSR but not VR in hands. It clearly indicates that VR and SSR may be inversely correlated during exercise. This result is consistent with the finding by Litscher et al.,  showing that skin resistance of an AP is lower than a non-AP but the thermography measurements of the two spots remain the same. It strongly suggests that electrodermal activity and skin temperature are controlled independently with different mechanisms. Future studies with better design and large sample size is needed. Electrodermal potential is thought to originate from skin sweat glands through SSR innervation and the increase of the electrodermal activity is due to the increase in sweat secretion. However, this study showed an increase in electrodermal activity in hands with a decrease in skin temperature. In the meantime, there was no change in electrodermal activity in feet but an increase in skin temperature, which results in much more perspiring in feet than hands. This finding suggests that the increase in electrodermal activity may not be a result of more perspiration, but likely a direct increase in electrical potential of sympathetic nerve endings. More research is needed to verify the finding. Emerging evidence indicates that APs in fingers and toes may have diagnostic properties via EAV testing. 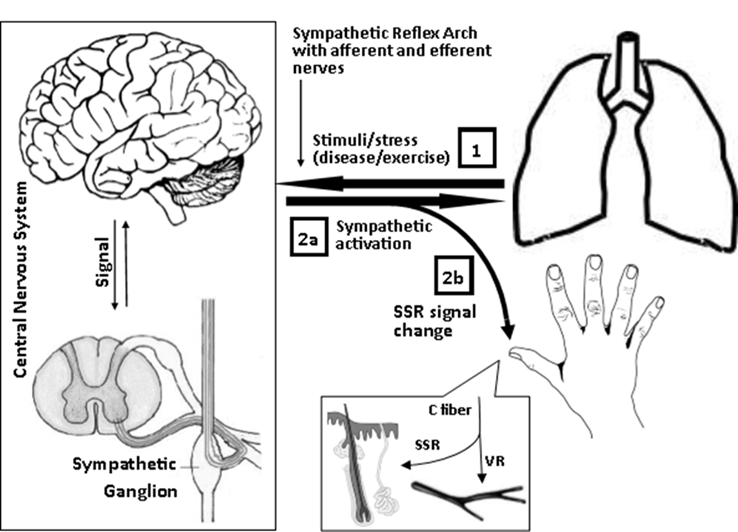 This study reported that exercise-induced sympathetic arousal for heart, respiratory, nervous and endocrine systems can be detected with EAV testing from corresponding hand meridians, probably via SSR innervation. The results of the study suggests that 1) SSR innervation may be meridian specific, meaning that each meridian may correspond to specific organ or tissue; 2) SSR may respond to exercise-induced stress independently from VR system, and 3) Skin temperature and perspiration may not affect EAV testing. Physiologic mechanism of EAV testing is further postulated in Figure 4. Stimuli such as exercise and/or diseases to the organ (Lungs) trigger stress signal sent to central nervous system via afferent nerve (1) of the sympathetic reflex arch. Autonomic response to the stress is sent to effector organ through sympathetic efferent nerve (2a). In the meantime, sympathetic activation can be detected using EAV devices from corresponding APs (2b). Innervated by sympathetic C fiber, SSR and VR can be activated simultaneously or independently. The specific response patterns may depend on the type, degree, location and duration of the stress. More research to address detailed physiologic mechanism is warranted. Figure 4 Possible Mechanism of EAV Testing. Several limitations can be found in this study. 1) The study included only one testing subject, whose physiologic response to stress may be biased. Although the subject was healthy with no detectable diseases and medication taking history, and the 15 experimental sessions were done in as long as three-month period, the result may still represent physiologic response from this particular subject. It is interesting to know if the response pattern can be reproduced with more testing subjects in future studies. 2) EAV meridian testing seems to reflect only the tonic component of the electrodermal activity. With some spectral limitations, EAV is unable to distinguish tonic and phasic signals nor provide frequency information during testing. However, up till now EAV is still one of the only few systems that specialize in detection of electrodermal activity of acupuncture points and can be used and obtain meaningful results in clinical practice. 3) EAV testing in the study was done by only one tester. It is known that EAV reading may vary among different testers depending on their training, experience and technique. Multiple testers may be included in future studies to examine the variance from different testers and reproducibility of the technique. Future studies with larger sample size and better design are warranted. Chronic diseases may progress through a pathway from a less-severe stage with an energetic imbalance to more-severe stages with biochemical changes and histologic damages. Most popular medical tests, such as blood chemistry and imaging techniques, are perfect for identifying biochemical and histologic changes, but leave a gap between the healthy and diseased stages. This gap, also known as suboptimal health, is recognized by holistic medicine proponents as the stage of energetic or functional imbalance. EAV testing is a perfect technique to fill this gap by detecting stresses of organs and tissues through meridian connections via SSR innervation. EAV testing is a simple, fast, noninvasive inexpensive technique and is perfect for screening for pre-disease conditions, which may not be reflected from patient’s complaints and history. With a complete meridian balancing profile in hand, holistic clinicians will make better clinical judgments in terms of diagnosis, protocol design, and treatment assessment, and, certainly, could produce better clinical outcomes, thus, achieve true holistic and personalized medicine. Despite the limitations of the study, significant increase in electrodermal activity of hand meridians LY, LU, NE, TW and HE was found after exercise. Significant increase in foot temperature and decrease in hand and forehead temperature was also observed. The finding is consistent with expected physiologic response to running exercise and it suggests that EAV can be used to detect stresses from corresponding organs and tissues. The finding also suggests that electrodermal activity of APs is likely to be controlled independently from skin temperature and perspiration. The study concludes that it is feasible to carry out large-scale study to further examine the effect of exercise on electrodermal activity with standardized EAV system. To further assess physiologic basis of EAV testing, additional clinical and mechanistic studies are warranted. The author did all work for this paper. Voll R. Twenty years of electroacupuncture diagnosis in Germany: A progress report. Am J Acupunct. 1975: 7-11. Voll R, Schuldt H. Topographic positions of the measurement points in electro-acupuncture. 1st ed. Uelzen Ger. : Medizinisch Literarische Verlagsgesellschaft; 1976. Nakatani Y. Skin electric resistance and Ryodoraku. J Autonomic Nerve. 1956: 52. Niboyet JEH. Part 2: Lower electrical resistance on skin surface corresponding to cutaneous acupuncture points and meridians (in French). In: Nibeyet JEH, Bourdiol, R.J., Regard, P.G., editor. Treatise on Acupuncture. Paris: Maisonneuve; 1963. p. 326-333. Sullivan SG, Eggleston DW, Martinoff JT. Evoked electrical conductivity on the Lung acupuncture points in healthy individual and confirmed lung cancer patients. Am J Acupunct. 1985; 13: 261-266. Ericsson AD, Pittaway, K., Lai, R. ElectroDermal analysis: A scientific correlation with pathophysiology. Explore. 2003; 12: 47-51. Boucsein W. Electrodermal activity. New York: Springer; 2011. Kucera P, Goldenberg Z, Kurca E. Sympathetic skin response: Review of the method and its clinical use. Bratisl Lek Listy. 2004; 105: 108-116. Garoppo CM. Effect of Aerobic Exercise on Electrodermal Measurement of Acupuncture Points [Doctoral Thesis]: Atlantic Institute of Oriental Medicine; 2016.